A huge thank you to Family Christian for sponsoring today's post. All thoughts are my own. If you've been around A Modern Day Fairy Tale for long, you know that this is a verse that I share frequently, a verse that holds a lot of meaning to myself for my family. It is a verse I use to remind myself that everything that happens in our lives- the good and the bad- are all part of God's plan, of His bigger story. It is something I believe fully with my whole heart. 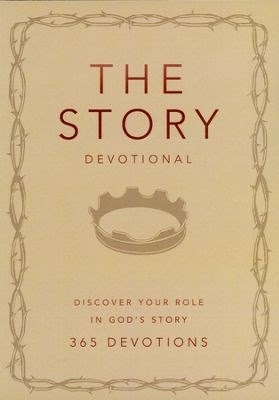 See your life and purpose in a whole new light as part of God s epic story with this beautiful leather-look devotional. Through 365 daily Scripture readings arranged chronologically, plus bite-sized reflections and a daily takeaway, this unique devotional illuminates how God has been weaving his plan throughout history. Each day, you ll be blessed with a reminder of God's unrelenting love and pursuit of his people. Sounds pretty wonderful doesn't it? As is stated, this is a great companion to The Story- a wonderful Bible translation that take the Bible from many separate books telling of the same story to one continuous story- but is certainly a great devotional all by itself as well. It is a great read for anyone looking to grow their relationship with God and discover His purpose for their life. I shared with you one of MY personal favorite verses, what are some of yours? Weeping may endure for a night, but joy is coming in the morning. It was for my peace that I had intense bitterness...but You have loved back my life from the pit of corruption and despair. You have put all my sins behind Your back. Amen. Thank you, Lord!! In all honesty, I don't have a favorite verse as there are so many that speak to me. However Stefanie Hein's choice is high on my list as well. This passage got me through many rough times. 6:25 “Therefore I tell you, do not worry about your life, what you will eat or drink; or about your body, what you will wear. Is not life more than food, and the body more than clothes? 26 Look at the birds of the air; they do not sow or reap or store away in barns, and yet your heavenly Father feeds them. Are you not much more valuable than they?